Sales reps today have been liberated from much of the manual labor involved in lead generation. Automated outreach and demand-generation campaigns can produce a high volume of leads with little effort. Scaling up is almost too easy, and before you know it you have more leads than you can touch. But what happens when an automatic lead generation system hands off this bundle of contacts to a human sales rep? 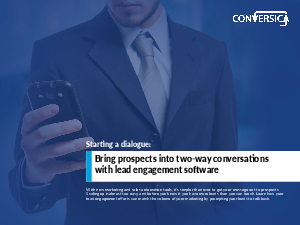 In “Starting a Dialogue,” Conversica shares how lead engagement efforts can match the volume of your marketing efforts by prompting your leads to talk back.